Daddy's Blind Ambition: It's official! 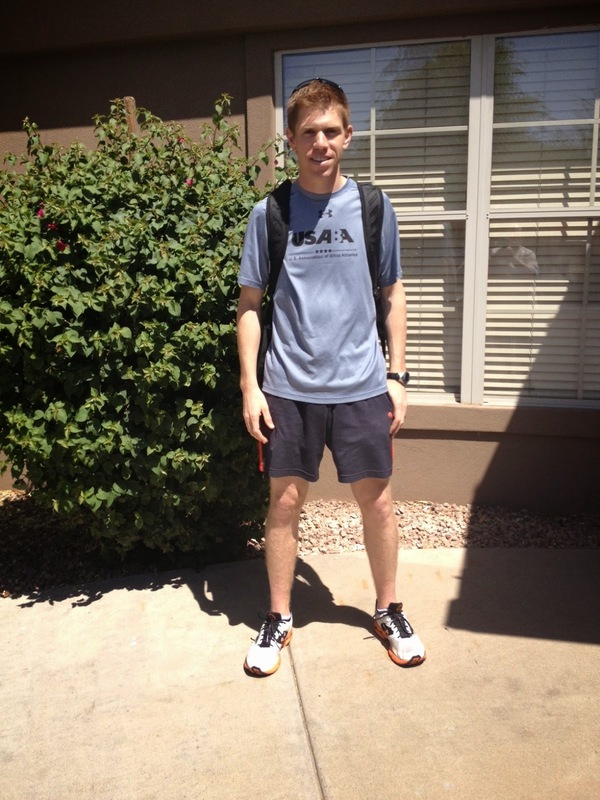 Matt now has an International Paralympic Committee (IPC) classification! Woohoo! I’m very excited. His flight out of Dulles was delayed three hours so I was getting nervous about him getting out there in time, but everything worked out well. As I’ve mentioned before, the classification was the main reason that Matt went to Mesa. He can now put a big check box on that to-do item. Now, he can enjoy the rest of the week there and compete in Saturday’s two events. What is an IPC classification? It is all a bit technical, but here’s my understanding. There are three categories for visually impaired athletes: T11, T12, and T13. Today Matt was classified as a T12 athlete. Technically that means that his visual acuity ranges from LogMAR1.50 to 2.60 (inclusive) and/or the visual field is constricted to a radius of less than 5 degrees. To come to this determination, Matt met with two ophthalmologists from the IPC, two representatives from the Desert Challenge, and one representative from the U.S. Olympic Committee. He was instructed to show up in athletic clothing with all of his gear, so for him that is basically running shoes, sunglasses, and a watch. The test was set up in a hallway with marks on the floor every foot. One of the ophthalmologists started with a card that had five 4-inch letter E’s on it. She would hold it up in various directions and he’d have to say if he could read it and which direction the Es were facing. She would progressively get closer and closer to Matt until he could tell her which direction the Es were facing. When she started he couldn’t see her at all. At about the 2 ½ foot mark he could tell her the direction of the Es. She then moved to a card with one eight-inch letter E on it. He had to do the same thing and again could start giving details at about the 2 ½ foot range. Next, she used an autorefractor to take a picture of his eye and give a reading of what his corrected vision should be, just like what happens when I go to the eye doctor. The only difference is that when I get the test done the eye doctor gets a reading and then confirms it so I can order my new contacts or glasses. On Matt, the autorefractor says that he doesn’t need any corrective lenses. That’s the thing with Lebers, it isn’t his eyes that don’t work, but rather the wiring. Finally, the ophthalmologist used a light refraction to see his optic nerve. The ophthalmologist was able see that his optic nerve is dull and pale, i.e., dead. If there’s a good thing about Lebers it is that it reaches a point and stabilizes rather than being degenerative as some visual impairments unfortunately are. In the 14 years since the onset, Matt’s vision has been the same. Nonetheless, the IPC decided to give Matt a two-year classification so that they can establish a baseline. He’ll have to be reclassified before the Rio Paralympics, but then his next license will hopefully be valid for a longer period of time. All last night the girls kept asking me if daddy was on an airplane and if he was going over the sea or under the sea. Apparently “The Little Mermaid” made quite the impression on them! Matt after his classification appointment.